Born 1867 in New Orleans, Annie May Wyant showed up in San Francisco sometime in the early 1890s. By 1895, using Jessie Mellon as her house name, she was boarding in Mrs. Nina Hayman’s “lodging house” at 225 Ellis Street, an address that later would become one of the best known in the annals of San Francisco prostitution. Opened in the late 1870s by Dolly Adams — former “Water Queen” of the Bella Union Theater — the Ellis Street establishment was taken over by Mrs. Hayman following Dolly’s retirement from madamship in the 1880s. Near the end of 1898, Nina Hayman retired to marry a wealthy San Francisco lumber dealer. As the house favorite, young Jessie took on her mentor’s name and business, and it was as Jessie Hayman or “Diamond Jessie” that she became famous. Jessie’s full story has been told with great warmth and wit by Curt Gentry in his book The Madams of San Francisco.¹ Suffice for me to say that she was strict yet fair and generous with her girls, and her parlor houses were the most lavish and fashionable in the district. She was tall and elegant, a shapely redhead and a lover of diamonds whose charms (and prices) were legendary in her own time, as illustrated by the following anecdote. In the late 1890s, photographer Arnold Genthe introduced Jessie to a Grand Duke of the Imperial Russian Empire, who wanted to take her back to Russia with him. When Jessie politely declined, the Grand Duke commissioned Genthe to make a life-size enlargement of her portrait. At a Newport luncheon honoring the Grand Duke the day before he returned to Russia, His Royal Highness proposed a toast. To the most beautiful woman I have met in your country. She shall be nameless. Even if she were not many miles away, she would not have been included in this gathering. I ask you all to drink her health. Thus it was that ladies of unquestioned virtue,* the cream of American society, raised their glasses and drank to a demimondaine, for a request from a Grand Duke was a command. The ultimate fate of the portrait is unknown. Perhaps it was destroyed by Bolshevik Red Guards during the 1917 October Revolution; or maybe, along with other detritus of the fallen empire, it was hidden in a cellar only to be forgotten and left to molder in darkness. No matter what actually happened to the enlargement, we know the negative was destroyed in the 1906 earthquake and fire, and thus the only known photograph of Diamond Jessie is as good as forever lost. (340/14) 136–142 Taylor Street; Dunphy Building. Stores and offices/lofts. 4B stories; brick structure; decorative window frames including third level arches, bracketed cornice and pediment; two-part vertical composition; Renaissance/Baroque ornamentation; vestibule: tile floor, sign painted on north wall: “United Railways Telegraph Schools”; alterations: ground floor, storefronts, aluminum windows, vestibule. Original owner: P. Dunphy. Architect: E.A. Bozio. 1906. Several months after the the 225 Ellis establishment was destroyed by the 1906 fire, Jessie moved with her girls into the top two floors of the newly-constructed Dunphy Building. There they stayed until the fall of 1907, when she acquired a new lodging house on Mason Street and furnished it as a deluxe bagnio. (341/7) 34-48 Mason Street; The Glenwood (1906); parlor house (1907); Polo’s Restaurant (1952). Storefront and loft. 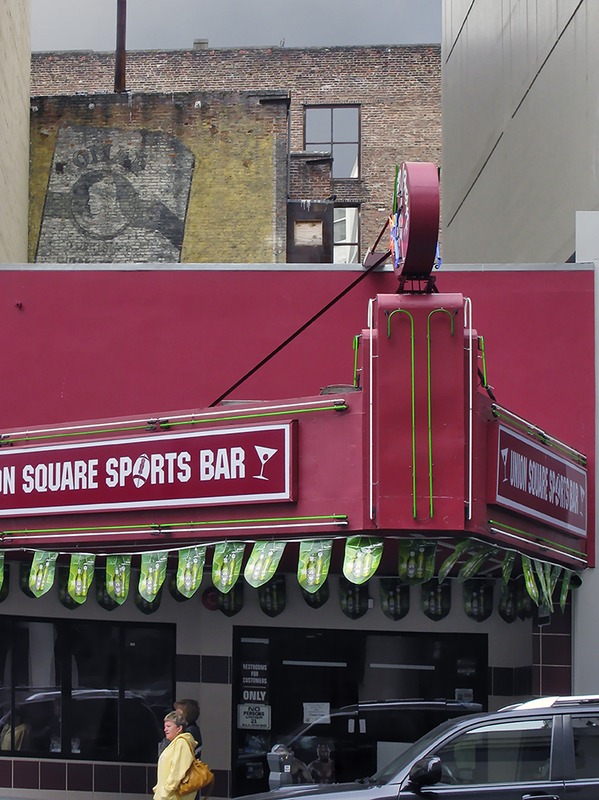 3B stories; brick structure; decorative brickwork including rusticated piers, galvanized iron cornice; two-part vertical composition; Renaissance/Baroque ornamentation; vertical neon blade sign. Alterations: ground floor remodeled. Architects: Meyers and Ward. 1906. From 1907 till 1912, when she moved her girls and furnishings to Eddy Street, the Glenwood was Jessie’s parlor house. Much later it would become Polo’s Stadium Club, for many years one of San Francisco’s most popular meeting spots for fine food and drink. (331/7) 128-132 Eddy Street; The Gotham Lodgings, parlor house, Belva Hotel, Crystal Hotel. Rooming house with forty-seven rooms and twenty-eight baths. 4B stories; brick structure; rusticated second level, upper level with decorative panels, bands, window surrounds, galvanized iron cornice; two-part vertical block; Renaissance/Baroque ornamentation. Alterations: ground level completely remodeled, lobby remodeled. Original owners: Daniel O’Neil, contractor, and Cora M. Twombly. Architect Charles R. Wilson. 1908. 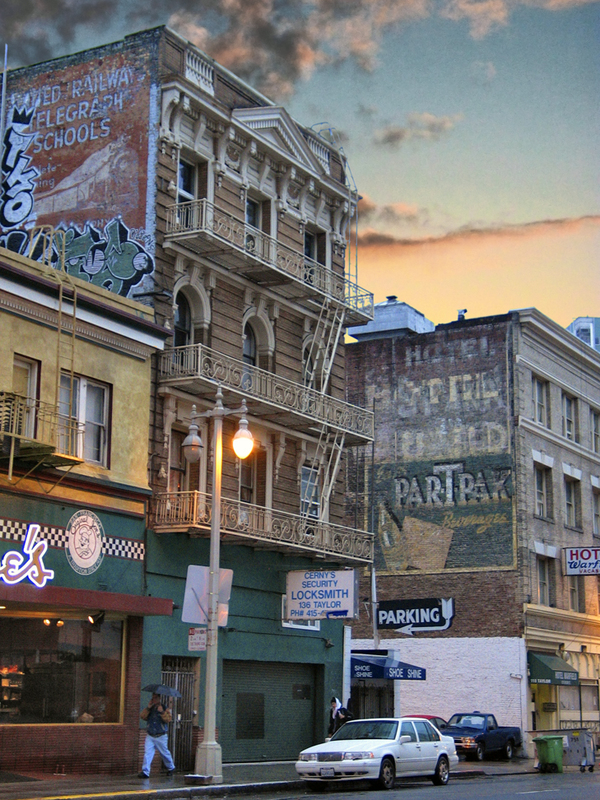 130 Eddy was the last of Diamond Jessie’s brothels, from 1912 until her retirement in 1917. The first floor was leased out as a saloon, the parlors and madam’s suite were on the second floor, and the girls’ suites, dining room and kitchen were on the upper floors. With the help of Jessie’s backing, one of her girls later became a leading Hollywood madam under the name Beverly Davis. In her autobiography Call House Madam,² Ms. Davis devotes several chapters to her mentor that include a description of the Eddy Street brothel. Jessie’s prices were staggering. She had a champagne cellar with wines from all parts of the world. Whoever furnished the house knew his Place Pigalle stuff. There was the red room, the gold room, the Turkish room, the French room, the blue room. oriental couches and shaded lamps, plush parlors one after the other with deep carpets on the floor. The bedrooms upstairs were done in the best style. It reflected ‘tone’ for a parlor house all the way through. When she died in 1923, Jessie’s net worth in diamonds and Tenderloin real estate was one hundred thousand dollars, the equivalent in 2009 dollars of well over one point two million. Crystal Hotel, 128-132 Eddy Street. One of my germinal photographs, the Crystal Hotel viewed from Mason Street is also one of my favorites. It captures the essence of the Tenderloin as a many-layered source of fascination. I was captivated by these walls long before I had a camera to photograph them. 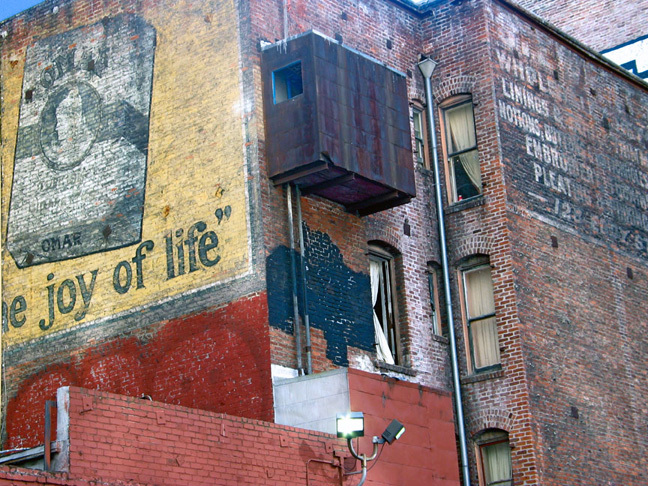 The faded advertisements afforded a glimpse of the past, but the peculiar, limpet-like annex was a real enigma. Could it have been a meat locker for the brothel’s kitchen? No one seemed to know. Near the end of 2005, an acquaintance told me of a former tenant who had used the tiny space as an extra bedroom by cramming a folding camp bed into it. Alas, this anecdote is all I have gleaned. The little annex and lovely ghost signs are now largely hidden, eclipsed by a new housing development, thus bringing to a close this page in Tenderloin history. 1. 1964, Doubleday and Company.